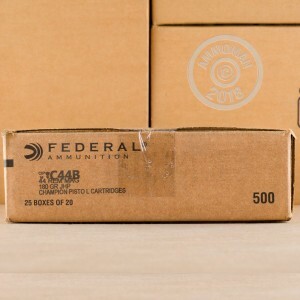 Federal Premium Ammunition is an American company and has always been one of the leading innovators when it comes to the development of hard-hitting rounds. Their Power-Shok line represents ammunition designed to penetrate deep, expand wide, and result in the most efficient energy dump possible. 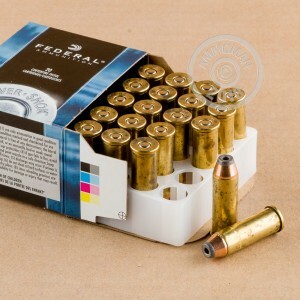 This load utilizes a 180 grain hollow-point bullet with a jacket that stops just short of the bullet's tip. The softer exposed lead at the tip of the bullet allows for more reliable expansion upon impact while the partial jacket resists separation in the target. 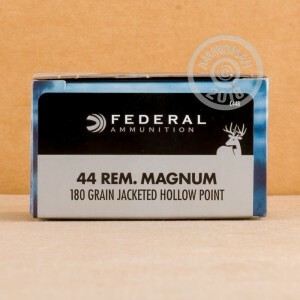 180 grains is on the lighter side of the .44 Magnum scale and thereby produces less felt recoil for faster and more accurate follow-up shots while still packing a punch with 1,460 feet per second of muzzle velocity. The bullet starts off from the muzzle with 852 foot-pounds of energy and retains 616 foot-pounds at 50 yards where it will only have dropped about a third of an inch.